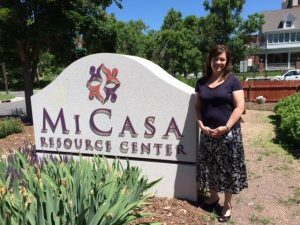 Mi Casa Resource Center was established in 1978 and has grown over the past decades to four locations in Denver, Colorado in response to a growing Latino community that now represent 31% of the population in the city. Mi Casa Resource Center programs and services are focused on advancing family prosperity. They accomplish this with a vision and firm belief that Latinos can flourish when opportunities are provided to excel in family, education, work, in business and in the community. To do this, Mi Casa offers an array of programs and services, including English as a Second Language, GED and basic computer classes. Career development training programs are available in customer service, bilingual bank teller and in healthcare, certified nurse aid and phlebotomist certification. Career training classes help workers update their skills and prepare for careers and employment in targeted growth industries. The business development program teaches new entrepreneurs all aspects of starting and growing a small business. Computer classes in PowerPoint, Excel and QuickBooks help small businesses understand financial planning and prepare them for success. Entrepreneurs benefit from these classes with assistance in developing a business plan they can execute to have success. Youth academic and leadership development programs and career exploration services are delivered at various school sites within the Denver Metro area.